Full XL Down Mattress Topper Mattress Size 54" x 80"
Our Down Mattress Topper is 50% soft down and 50% soft feathers. Our down and feathers are specially processed soft duck. Our Down Mattress Toppers are wonderful! They have an incredible 5 inch loft depth! The box baffles are spaced between 12 inches and 15 inches square, depending upon the size of the down mattress topper that we are sewing. The down baffles help provide luxurious comfort and keep the feathers and down where they need to stay. The outer fabric is a fine, soft feather proof 230 thread count cotton twill weave. Our down mattress toppers are hypoallergenic, anti-bacterial and yes, even washable. 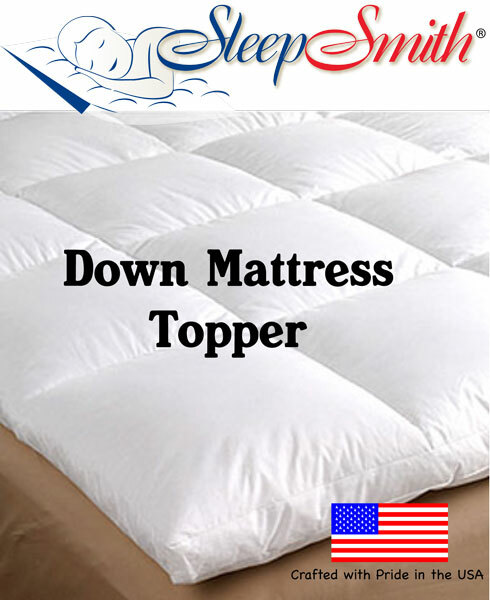 Down Mattress Toppers are designed to just lay on top of a mattress. There are no straps or attachments. Gravity does the work. When I asked a fine older sales lady that has sewn feather beds and such all of her life, how the feather bed stays where it is supposed to stay she said, "it just does honey." Please allow 10-15 business days plus time for transit for shipping, as we custom sew this down mattress topper for you. WASHING INSTRUCTIONS: Machine wash in cold water, gentle cycle with very mild detergent. Tumble dry on very low heat. Make sure that your topper is completely dry before re-use. Washing will decrease comfort a bit. These Full XL Down Mattress Toppers measure 54" x 80" and are approximately 5" thick.